Despite the name, the Mexican Riviera is really quite distinct from the Riviera region on the Mediterranean Ocean. Mexico is not Europe, after all. And that’s a good thing. I’ve just returned from an 11-night cruise to six ports on the Pacific coast of Mexico, sailing on Royal Caribbean’s Radiance of the Seas. Most cruise lines now sail this area for only seven nights, but because my husband and I wanted to visit more ports on a longer cruise, we chose this one. Radiance of the Seas is a lovely ship with glass walls and elevators throughout giving passengers a close up look at each destination. In fact, half the ship’s exterior is glass, a feature that lends beauty and class to this mid-size ship. With almost three-fourths of the cabins sporting balconies, keeping up with the itinerary was easy. The Radiance is celebrating almost nine years of service, carrying 2500 passengers and a crew of more than 800. As with most longer cruises, this one attracted a primarily 55 + crowd, although Royal Caribbean generally caters to families as well as couples and singles. Food in the dining rooms was excellent, although most dining venues closed too early for late night snacks—the exception being the Mexican buffet held one night at 11:00 p.m. Along with themed bars and lounges, the ship offers two specialty restaurants, Chops Grille and Portofino Italian Restaurant. Another plus was the outstanding entertainment, from pianist and musician Glen Smith to a magician, a juggler, Buenos Aires tango dancing team, two production shows, and comedian Marty Allen (he’s surprisingly bright and agile for almost 88 years old!) with his talented wife, singer-song writer and pianist Karon Kate. The rock climbing wall is a special feature of all Royal Caribbean ships—and we both sprinted (at times struggled) to reach the top and ring the bell. The Colony Club, a British colonial-style lounge features two self-leveling pool tables, first on a cruise ship. Miniature golf, ping-pong, basketball, bingo, ice carving, pool activities, and a variety of trivia and name-that-tune style games joined art auctions and casino gambling for additional entertainment. Of course, lounging, reading, card-playing, and sleeping were popular ways to loll away the time, and the indoor pool was especially inviting on two cool sea days. Being the middle of winter, it was no surprise that more than a fourth of the travelers were from Canada. 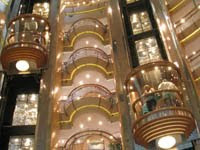 Music filled most areas of the ship, especially the Centrum, each afternoon and evening. The Spa beckoned those looking for super relaxation, and the Fitness Center encouraged cruisers to burn off extra calories. Plenty of public spaces kept the ship from feeling crowded. Best of all, was the opportunity to soak up sun on beautiful beaches, snorkel among dazzling tropical fish and multi-hued coral, swim with dolphins, kayak around small islands, spot whales in the ocean, and gasp as cliff divers plunged into the water from unthinkable heights. Mexico is casual, lively, and colorful--a destination full of fun for everyone—and the Radiance of the Seas was perfect for transporting us to this magical land.